The VSS requires Supervisor Engine 720 with 10-Gigabit Ethernet ports. You must use either two VS-S720-10G-3C or two VS-S720-10G-3CXL supervisor engine modules. The VSS requires 67xx series switching modules. The VSL EtherChannel supports only 10-Gigabit Ethernet ports. The Virtual Switch Link (VSL), like the VPC peer-link in VPC, is clearly a vital part of the VSS. It provides the signaling path used for synchronizing the two supervisor engines’ control planes, as well as providing the data path for any user data traffic needing to pass between the two chassis. The running configuration of the individual switch is converted into a three-level virtual switch interface notation. Two-level interface configurations (such as 10 GigabitEthernet 5/4) are converted into three-level interfaces (such as 10 GigabitEthernet 1/5/4 in Switch 1 and 10 GigabitEthernet 2/5/4 in Switch 2) like in a stack. The startup configuration is updated with the three-number notation. A copy of the original startup configuration converted to three-number notation is written to the bootflash of the respective switch. *Sep 15 12:38:06.395: %SYS-5-RELOAD: Reload requested by Exec. Reload Reason: Conversion. *Sep 15 12:38:09.406: %SYS-SP-3-LOGGER_FLUSHING: System pausing to ensure console debugging output. *Sep 15 12:38:09.610: %SYS-SP-3-LOGGER_FLUSHED: System was paused for 00:00:00 to ensure console debugging output. *Sep 15 12:38:13.152: %SYS-SP-3-LOGGER_FLUSHING: System pausing to ensure console debugging output. Wait more or less five minutes, then convert the second switch. *Sep 15 12:38:16.795: %SYS-5-RELOAD: Reload requested by Exec. Reload Reason: Conversion. *Sep 15 12:38:19.106: %SYS-SP-3-LOGGER_FLUSHING: System pausing to ensure console debugging output. *Sep 15 12:38:19.619: %SYS-SP-3-LOGGER_FLUSHED: System was paused for 00:00:00 to ensure console debugging output. *Sep 15 12:38:19.152: %SYS-SP-3-LOGGER_FLUSHING: System pausing to ensure console debugging output. 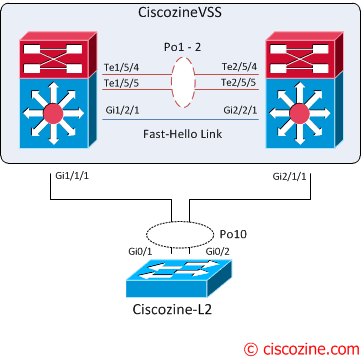 The name of the VSS is CiscozineA; rename it to “CiscozineVSS”. The interface name is converted into three-level interface. The first number (one or two) identify the switch. The VSLs can be configured with up to eight links between the two switches across any combination of line cards or supervisor ports to provide a high level of redundancy. 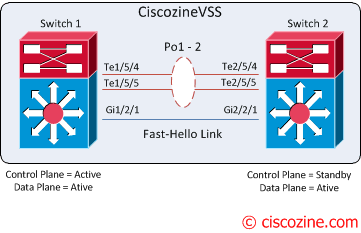 If for some rare reason all VSL connections are lost between the virtual switch members leaving each virtual switch assumes the role as the active virtual switch, and each virtual switch controls only its local ports. Duplication of this configuration can possibly have adverse effects to the network topology and traffic. In this tutorial, “fast-hello” is implemented. Note: If the dual-active detection is not configured, the system will suggest to implement it! %VSLP-SW1_SP-5-RRP_RT_CFG_CHG: Configured priority value is different from operational value. Change will take effect after config is saved and switch 1 is reloaded. Note: the switch priorities affect role determination if both virtual switches are initiated simultaneously . If either switch (regardless of priority) is initiated prior to the subsequent switch, it always assumes the role of the active virtual switch. After these steps, the VSS configuration is completed! The multichassis EtherChannel (MEC) is another term to identify an etherchannel that allows a connected node to terminate the EtherChannel across the two physical Cisco Catalyst 6500 Series. 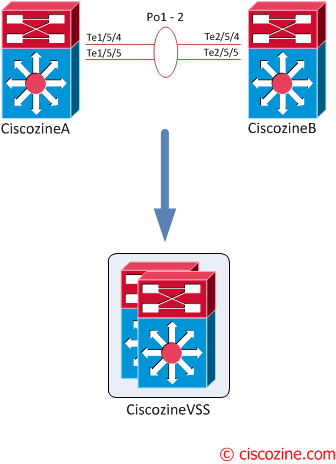 In this example the “Ciscozine-L2” switch is connected to the CiscozineVSS using a MEC. 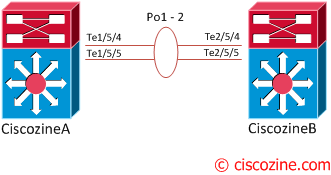 For these reasons, on the Ciscozine-L2 is possible define the port-channel10 with the interfaces Gi0/1 and Gi0/2. To find more informations about etherchannel read this article. Note: After the VSS conversation, some “show” commands have the feature to view the output of individual switch! For instance, to see the modules of the second switch use “show module switch 2”. where either Switch 1 or Switch 2 can be specified. The VSS allows the clustering of two chassis together into a single, logical entity. This technology allows for enhancements in all areas of network design, including high availability, scalability, management, and maintenance.